Most people enjoy theme parks as a place to get away from work, but for those in the hydraulics industry, they are a place to demonstrate their expertise. 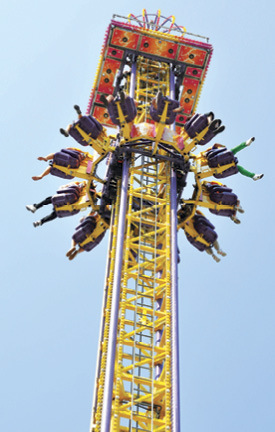 Behind many of the rides that make your stomach drop or your eyes blink in amazement, accumulators are picking up the stresses and enhancing the performances of hydraulic technology. Behind the scenes, there is complex machinery that must run precisely and smoothly to ensure safe and reliable operation. Whether you are splashing through water, sailing above the tree lines, or being wowed by animations and simulations, powerful equipment that depends on the science and engineering of hydraulics is enriching your activities. And many of these large, powerful hydraulic systems rely on accumulators, hidden from the public view, but critical in their roles. Typically, accumulators installed in hydraulic systems store energy to either provide an extra boost of power, or absorb energy to smooth out pulsations. 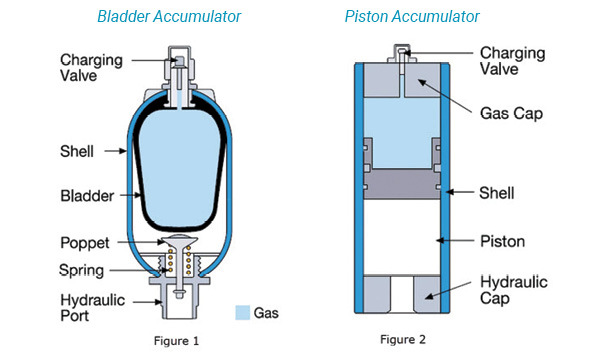 Accumulators used in theme parks are gas-charged, and are either bladder accumulators or piston accumulators. Bladder accumulators are cylinders that contain a rubber bladder (See illustrations above). 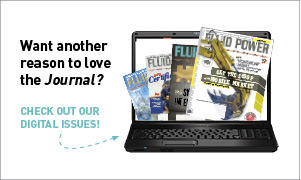 Hydraulic oil is kept under pressure when the bladder is inflated with non-flammable compressed gas, often nitrogen. When a ride needs a quick burst of power, a valve opens and releases the pressurized hydraulic fluid. A video of this process can be viewed at https://youtu.be/RMDE5v3ouN8. Piston accumulators are metal tubes with an enclosed piston. One side of the piston is charged with a pressurized gas and the other side with hydraulic oil. When the ride requires additional power, the pressurized gas pushes against the piston, which forces hydraulic oil back into the ride’s power unit. A video of this process can be viewed at https://youtu.be/1GBHtYqoznk. Accumulators often play valuable roles in hydraulic systems that power rides for a variety of reasons. As you can imagine, moving multi-ton cars, coasters and props, often times with rapid acceleration requiring extreme bursts of force. Delivering this concentrated force is taxing on hydraulic systems and can cause jerky movements. Accumulators work to absorb these extreme pressures and movements, store energy, and keep performance consistent – delivering the extra “push” when a hydraulic system needs it. Often there are many accumulators used on each ride. For example, on motion-simulator rides, which have become quite popular since the 1980s, many accumulators are used. These are amazing rides where people feel all the shakes, rattles, and rolls depicted in a movie shown on a large screen. A big surge of energy is needed to move the platform. On one of these motion-simulator rides at a popular national theme park, there are 24 platforms, each with banks of 10-gallon bladder accumulators. Each time the platform moves, a quick burst of energy is needed. These accumulators provide the high acceleration needed to make the ride exciting and memorable. Safety, of course, must be at the forefront of manufacturing accumulators. A ride that breaks down can cause injuries or worse. Most bladder accumulator failures are from the bladder failing so many companies—like Parker Hannifin—go the extra mile to minimize that issue by making their own bladders for quality control reasons. Knowing how important the chemical process is in the making of these bladders, companies often have their own chemist, who buys the rubber and mixes the bladder compounds. With everything controlled and created in-house, this helps them produce accumulator bladders that are of the highest quality and reliability. And when a piston accumulator fails, it is typically a result of a leak in the rubber seal located on the outer circumference of the piston. A proper functioning seal separates the gas from the oil. Gas molecules are very small and can penetrate through the rubber seal. Companies, then, apply their expertise in rubber composition to develop seals that minimizes the gas permeation, thus extending the life of the piston accumulator. 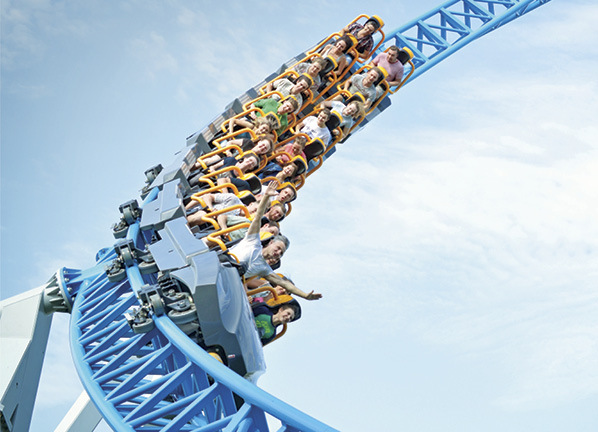 The next time you’re at a theme park waiting to ride, we hope that the greatest energy is the energy of the moment. 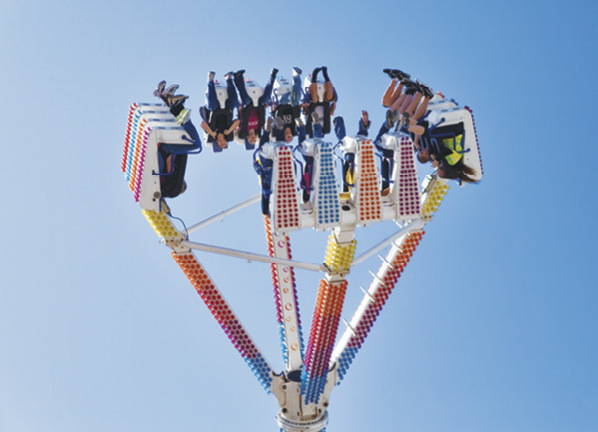 However, you might take a moment to appreciate the extreme amounts of force and energy required for your favorite ride to give you a hair-raising experience.